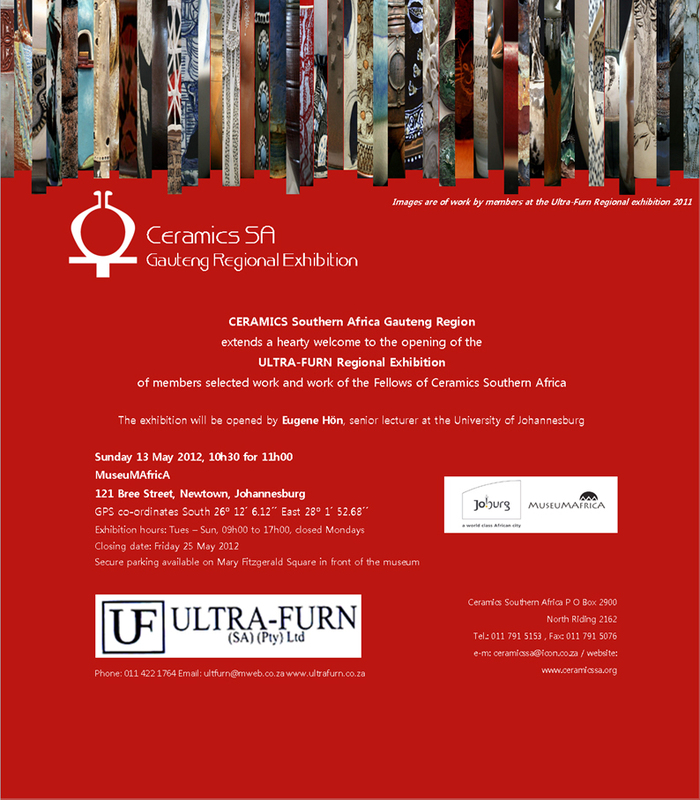 There are usually not many ceramic exhibitions on at one time in Gauteng, and to be a part of 3 openings in one week is quite a feat! 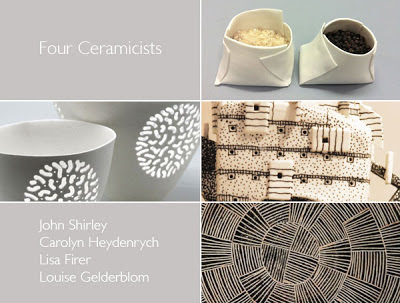 Last Saturday saw the opening of 'Four Ceramicists' at the Kim Sacks Gallery which I featured in my previous post and it will run until the 5th January. 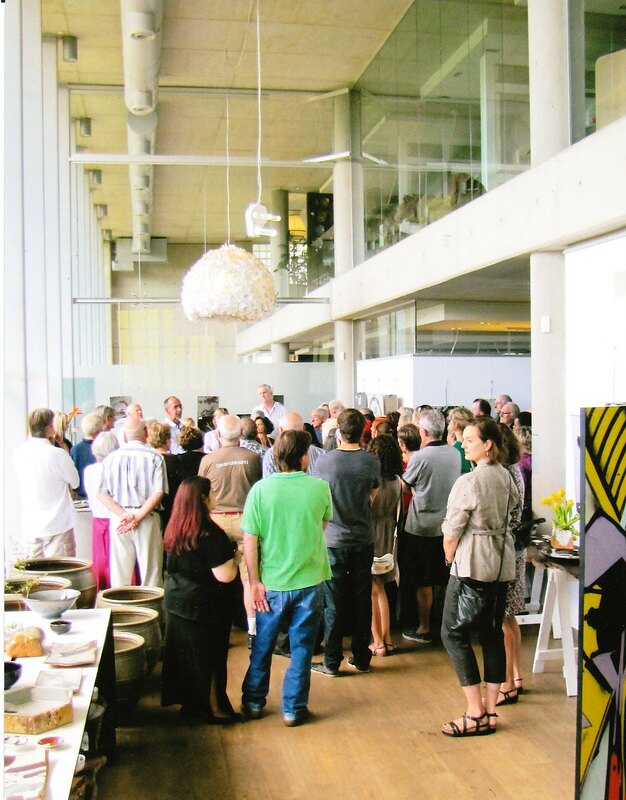 On Friday evening the 'Black and White' exhibition opened in Pretoria, and yesterday was the opening of 'Translucencies' at Art Afrique at Legacy Corner in the Mandela Square. It features the work of 7 ceramists using porcelain and bone-china as their preferred medium. It will run until Sunday 2 December. On Saturday 17th November at the Kim Sacks Gallery I will be share an exhibition 'Four Ceramicists' with Carolyn Heydenrych, Lisa Firer and Louise Gelderblom. 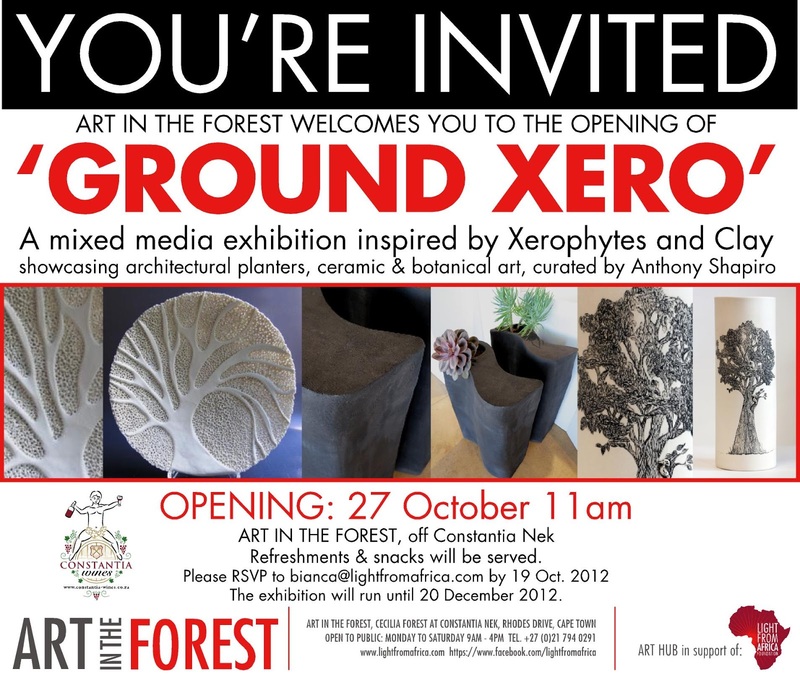 There will be a walkabout at the exhibition opening at 2:30 pm conducted by Carolyn Heydenrych and myself. 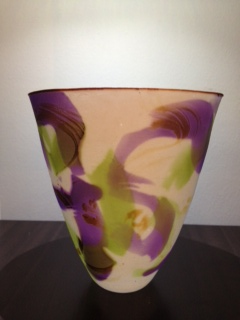 One of my pieces on the show. 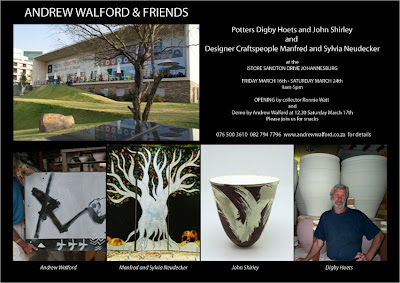 It has been some time since I have had new work on show in the Cape. I have few pieces on this group exhibition curated by Anthony Shapiro at this beautiful venue. 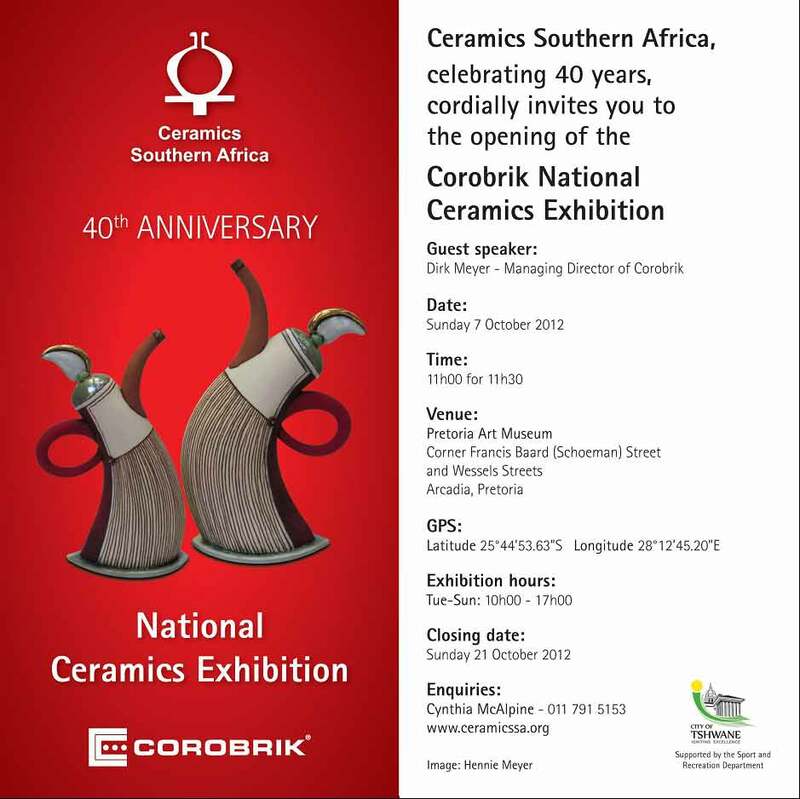 The exhibition opens on Saturday October 27 at 11:00 am. If you are in the area it will be great if you can be there. 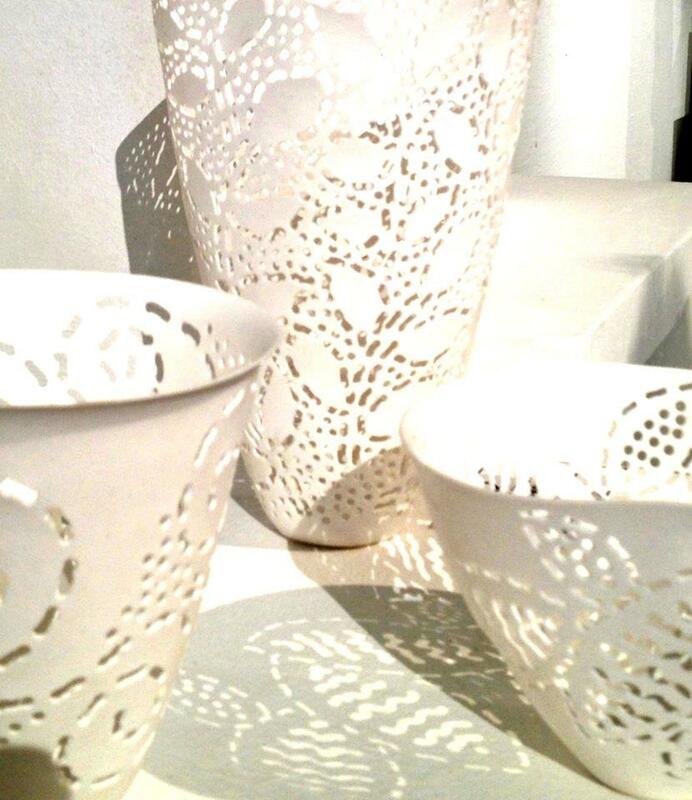 I love coming up with new ideas and testing and developing them into my work. I have been carrying out a number of new tests recently using the soluble salts in new combinations and I find this particular one quite exciting and it opens many new opportunities for development. 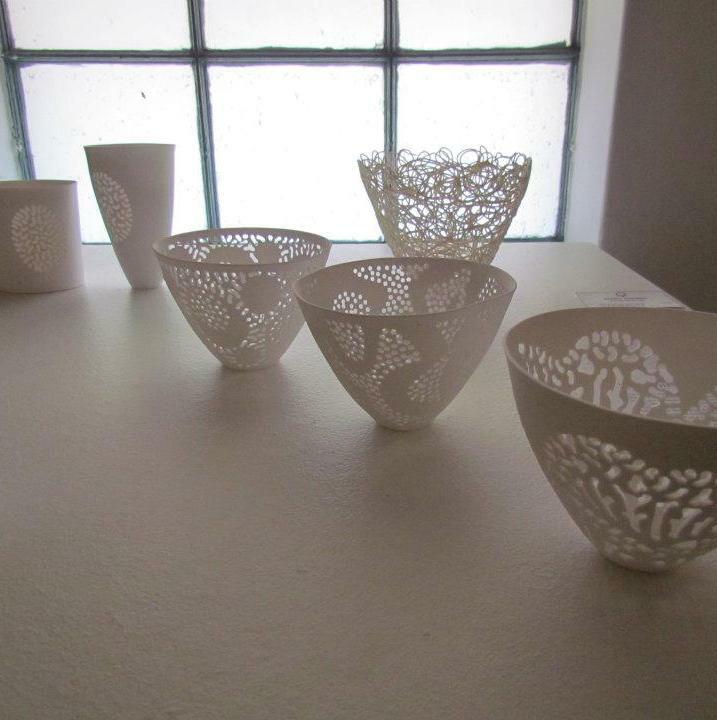 An image of my work on the exhibition by Pam Schroeder. 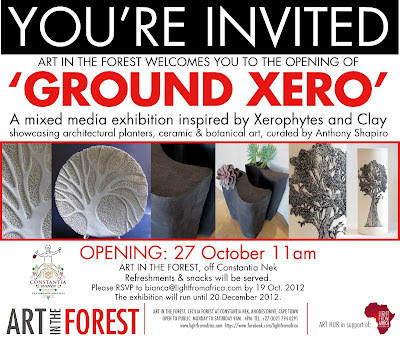 The Pretoria Art Museum charges an entry fee but is waiving this for people coming for the walkabout on Saturday. Don’t miss out. Undoubtedly one of the major events on the South African ceramics calendar is the National Exhibition hosted by Ceramics Southern Africa. 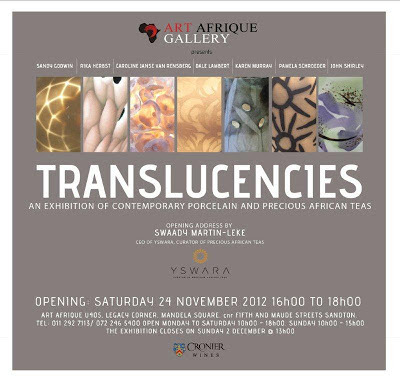 This exhibition opens today at the Pretoria Art Museum cor. 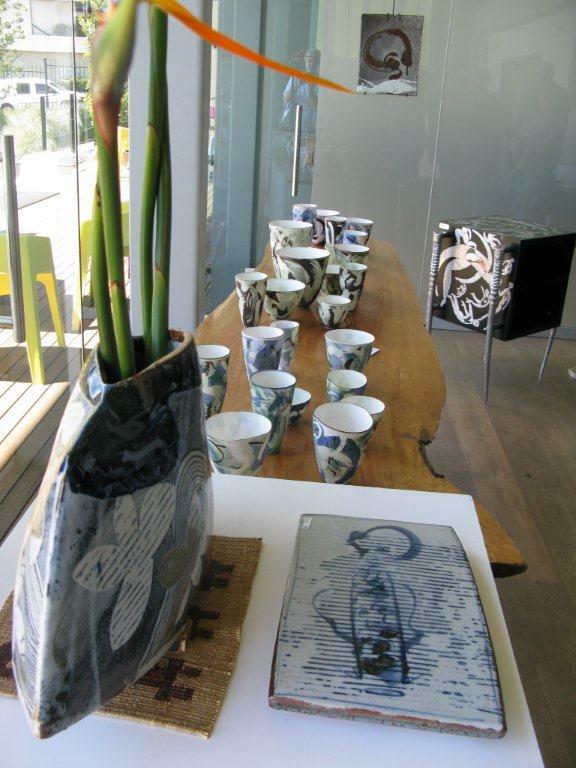 Francis Baard (Schoeman) & Wessels Streets Arcadia at 11:30 am and runs until the 21st October. 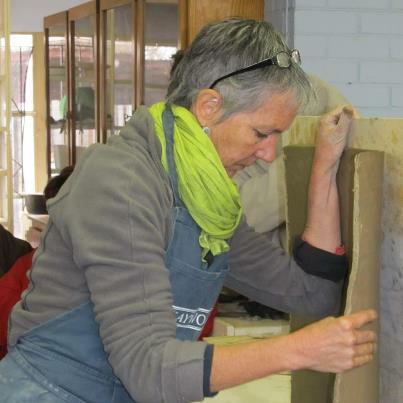 At today's opening, awards totalling R30,000 will be presented by Daphne Corregan, an international ceramic artist from France, and new Fellows of Ceramics Southern Africa will be announced. 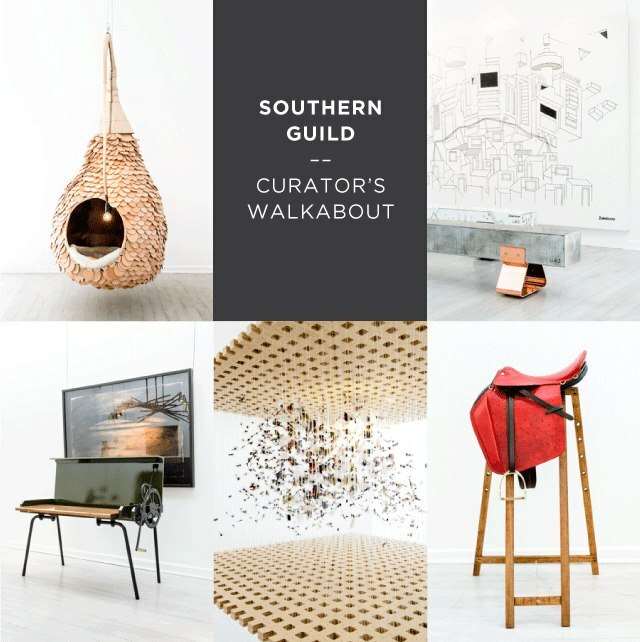 There will be 2 walkabouts at the Southern Guild exhibition at the Everard Read Gallery, Jellicoe Ave, Rosebank (TEL. +27 (0)11 788 4805) on Thursday 6th September at 3:00 pm and on Saturday 8th September at 11:00 am. Don't miss this really exciting show or this opportunity to hear the curator's observations and impressions. 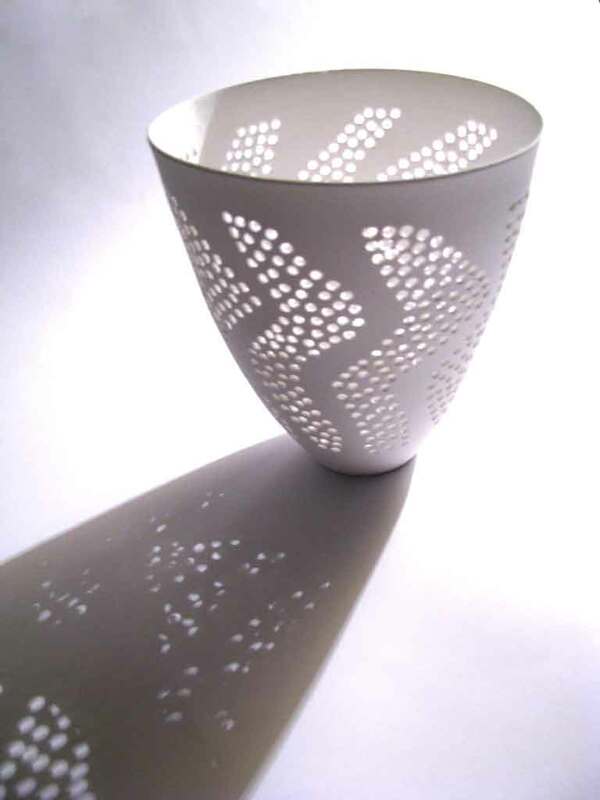 The exhibition will close Monday 8th October 2012.
and a discussion at 2.30pm on the day of the opening. There is an exciting trend to use transferred imagery in ceramics these days, either on its own or in combination with other methods of decoration. 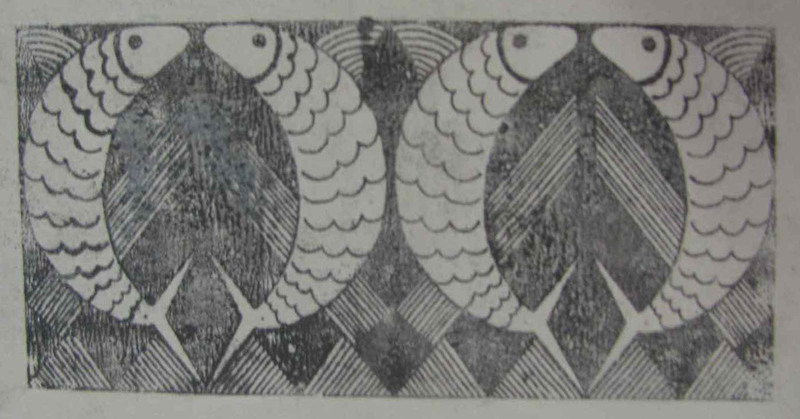 I have been exploring methods of image transfer on ceramics for some time and will present my New Image Transfer workshop this Friday, 29th June from 9:30 -12:30 at The Pottery Studio, 24 Old Kilcullen Road, Bryanston. 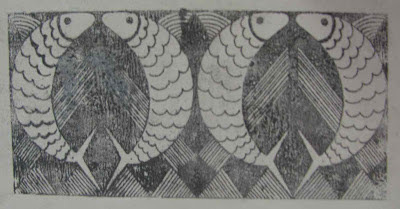 I will cover ways of transferring images onto the ceramic surface and this could open avenues for you to explore in your own work. 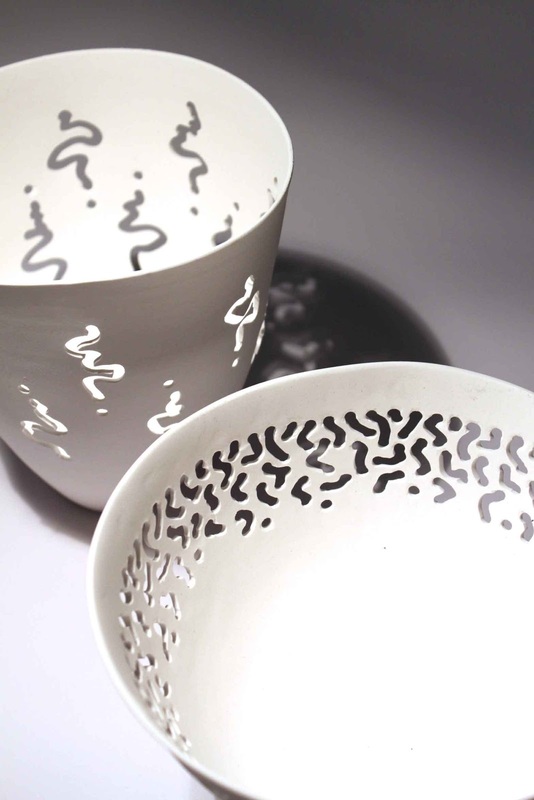 Methods shown will include a lithographic printing method and a new process using negative imagery with slip and underglaze, which allows you to transfer images in any colour of your choosing, which I think is the most exciting of all! I will also discuss the making of ceramic decals using laser printing. 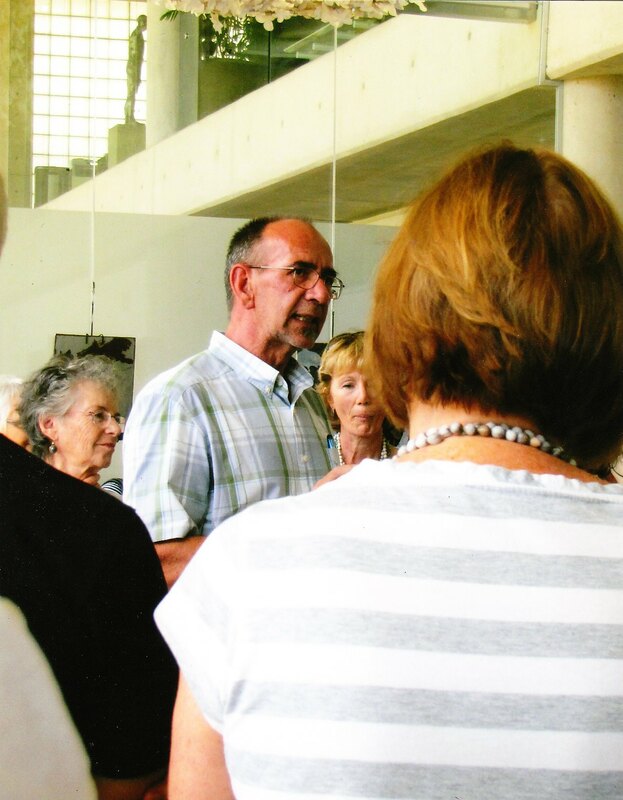 What a wonderful week spending and sharing time at the iStore Sandhurst with fellow exhibitors at the show 'Andrew Walford and Friends' The opening was well attended as seen by the images here. Ronnie Watt opened the exhibition, and it was so wonderful to reconnect with old friends and to make a number of new ones. 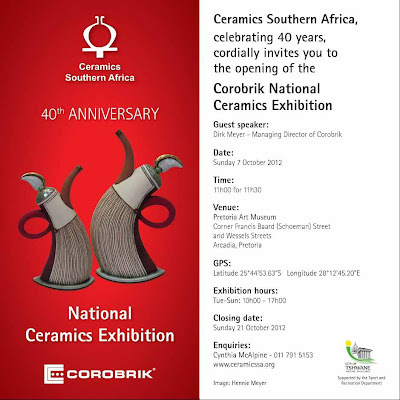 Don't miss this exhibition. 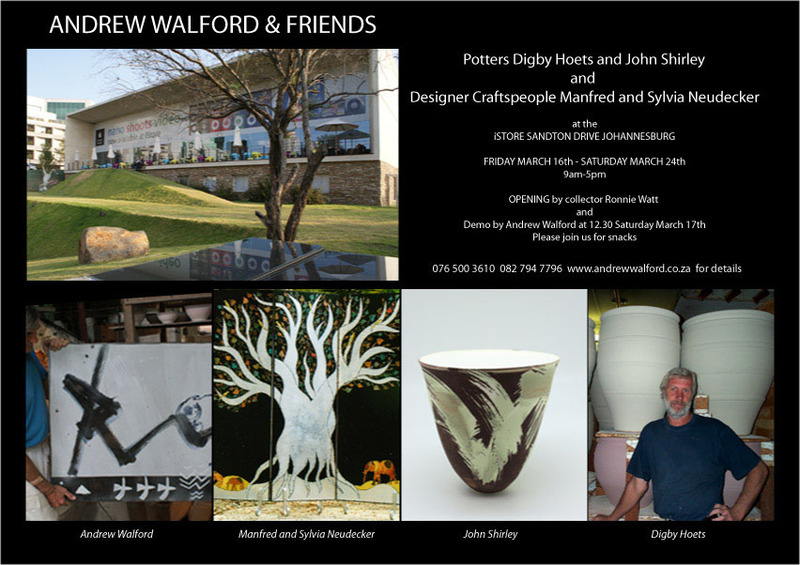 A really exciting mix of work and Andrew will be demonstrating at the opening at 12:30 on Saturday 17th March, at the iStore, 1 Sandton Drive, Sandhurst. Opening address by well-known collector Ronnie Watt. It would be great to see you there! 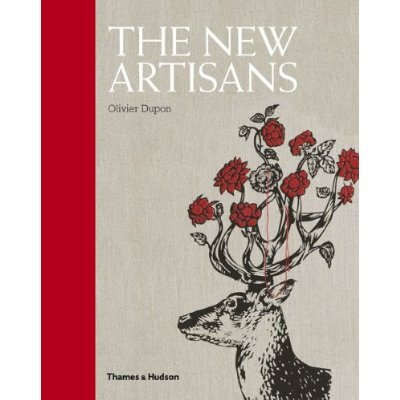 I have recently come across a beautiful new book titled 'The New Artisans' by Olivier Dupon. To quote from the back cover, "Profiling over seventy artisans who use craft techniques to create stylish, whimsical, desireable objects, this book features hundreds of one-of-a-kind, handmade wonders from all over the world." I unreservedly recommend this volume to anyone interested in contemporary crafts. 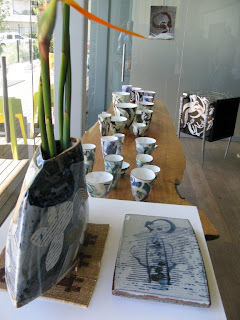 Not only ceramics but furniture, metalwork, lighting, jewellery and other disciplines. I must add that I love the word 'artisan' to classify those of us who work with our hands, and for me the word fits better than any I know.